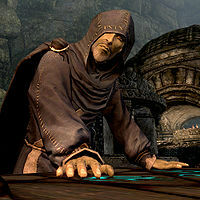 Calcelmo, Scholar of Markarth, is an Altmer conjurer of great renown who dedicates himself to researching the Dwemer. He and his nephew Aicantar study the Dwemer ruins beneath Markarth. He is the author of the series of books known simply as Dwarves. His next expected work is a book on the translation of the Falmer language which is tentatively titled Calcelmo's Guide to the Falmer Tongue. For other historical information, see the lore article. He leads the excavation site in Understone Keep, along with Aicantar. To find him at his workplace, enter the keep and turn left (south), and proceed a short distance through the "tunnel" (as others in the keep refer to the area) until you come to a short flight of steps. Turn and look west. His area is near an arcane enchanter and an alchemy lab. There are a number of pieces of scrap metal around his workshop that respawn periodically that yield a total of 21 Dwarven metal ingots when smelted. They are flagged as owned by Calcelmo, so taking them is considering stealing until you increase his disposition towards you. Calcelmo wears blue mage robes and a pair of boots. He carries an iron dagger, a key to Nchuand-Zel, a Dwemer Museum key, and a selection of common loot and gold. Being a wizard, he knows a large amount of spells. From the school of Alteration, he knows Oakflesh and Stoneflesh. From the school of Conjuration, he knows Conjure Flame Atronach, Raise Zombie, and Reanimate Corpse. From the school of Destruction, he knows Chain Lightning, Fireball, Firebolt, Lightning Bolt, Incinerate, and Thunderbolt. Lastly, from the school of Restoration, he knows Close Wounds, Fast Healing, and Steadfast Ward. Being a very dedicated wizard, he devotes all his time to study, never stopping to eat or sleep. The only exception to this routine is after you set him up with Faleen (see this section); he'll then eat with her between 6am and 8am, and 8pm and 10pm. Excavation site? "Nchuand-Zel? The ruins underneath Markarth? The wealth of artifacts that I've based two human lifetimes of research on?" Are you a wizard? I wanted to buy some spells. "Magic. That's what they always want. Never history. Never the secrets of the lost races. No, just little spells and enchantments." I was looking for you, actually. "I told you I'm not hiring any more guards. Why do you people always bother me when I'm trying to finish my research?" Either way, he'll then say, "You idiot. Do you even know who I am? The most recognized scholar on the Dwemer in all of Tamriel, and you people keep bothering me! I... I'm sorry I... I got too excited. I'm in the middle of some very... stressful work, and I shouldn't have yelled. How can I help you?" You can now ask why he would need guards, to which he'll answer, "To protect my research, for one. There are more cutthroat scholars out there who would steal my findings if they got the chance. And the excavations into Nchuand-Zel are dangerous. Dwemer machines and traps still function even after thousands of years." You can also ask if he's researching the Dwemer, to which he'll say, "Yes. Their history and culture is all around us in Markarth. A race of stonecutters, artisans, and engineers. They invented machines and built elaborate underground cities where they researched powers to rival the gods themselves. And then, at a time we are still not sure when, they disappeared. The whole people, all at once. Leaving behind only their works." If you bring him a delivery from Kerah, he'll say, "Oh, that's right. I keep forgetting to pick that up. Poor Kerah, such a patient woman. Now, you're supposed to get something for your trouble, aren't you? How about some gold? People seem to like that, I notice." If you greet him later, he'll say, "I have things to study, what is it? ", "The artifacts I've discovered in Nchuand-Zel will make history one day. ", "I've only ever lost a few guards to Steam Centurions. Good odds, considering...", or "I used to travel so much before all this Forsworn nonsense. Such an inconvenience..." When exiting conversation, he'll say, "What? Oh, goodbye." or "Yes, yes. I have a lot of research to do." Aicantar: "'Next season for sure...' What? Uncle Calcelmo, I don't understand what you mean." If you try to enter the Dwemer Museum, a guard will stop you and point you to Calcelmo for entrance. When you approach Calcelmo telling him you heard he owns the Dwemer Museum, he'll say, "Correct. It's a private place where I can catalog my research. 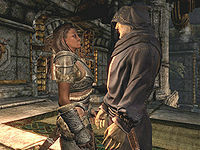 Occasionally, the Jarl will come in and have questions, but that's thankfully rare." You can directly ask to see the excavation site, to which he'll say, "Persistent aren't you? Oh, very well. Who am I to stand in the way of curiosity?" Either way he'll then say, "I'll let you in if you agree to something for me. There's a giant spider in Nchuand-Zel. My workers call her 'Nimhe,' the poisoned one. If you deal with Nimhe, I'll let you into both the excavation site and my Dwemer Museum. What do you say?" If you tell him you're not interested, he'll say, "Oh, very well. Probably safest that way." If you tell him the spider is as good as dead, he'll say, "Enthusiasm. Good. Here's the key to the dig site." When you return after having killed Nimhe, he'll say, "You have my gratitude. That spider had been interfering with my excavations for months. As promised, here's the key to the Dwemer Museum. Mind the displays. Some of them are quite fragile." During the quest, Dinya Balu will send you to help Calcelmo. When you approach him saying you were sent by Mara, he'll say, "I was beginning to lose faith that any help would come. Eh... You see... I've been thinking about Faleen quite a bit. You know Faleen?" You can either tell him you do, to which he'll reply, "Then you know what a beauty she is." or you can say you don't know her, to which he'll say, "Well, suffice to say she is resplendent, but not without resolve. Striking, in all senses." Either way, he'll then continue, "The trouble is that I can't seem to speak around her. My mouth goes dry, and I start to shake. I could never hope to approach her." If you tell him he just needs something to talk about, he'll say, "That's the trouble. I know Faleen from the Keep, but I have no idea what sorts of things she likes. It's not a simple matter. I could offend her fairly easily by bringing up the wrong subject. I've seen it happen before." You can tell him he's overthinking this, to which he'll say, "That may be the case. But she is as volatile as a sabre cat. One wrong word, and I've seen her turn on a man so quickly..." You can now ask if there's anyone who knows what she likes, to which he'll say, "There is one... Yngvar. He's quite popular with the ladies. Thankfully Faleen is not quite his type, but they've been friends for some time, and he may have some ideas. Please, ask him what she likes. It's my only chance." Faleen: "Sssh. It's all right. You don't need to say anymore. I had no idea you were so... nuanced." Faleen: "So I hear. Come here, you." Sounds fair. Here you go. (Gain gold) "Wonderful. You've just made an important contribution to the advancement of a Dwemer scholarship." Not good enough. I'll hold onto this. You'll need to find another one. "Oh... well... I can see you have no appreciation for scholarship." Not good enough. I'll shake the extra coin out of you if I must. (Intimidate) Passed: "Hold on, there. I suppose, in the uh, interest of research... I can spare a few more coins. Double and a half its value. That's all I can muster." Failed: "Ha! I'll see to it the Jarl hears of your abuse of a court scholar. Shame on you." I think you can do better than that. (Persuade) Passed: "Well... I suppose important research is worth every coin. All right. You have yourself a deal. How's double and a half its value in trade?" Failed: "With this the world could have a better understanding of the Dwemer! Come now, where's your sense of propriety? Extorting an old man like this." If you successfully persuaded or intimidated him you can tell him not good enough, getting the same response as above, or say his offer sounds fair, to which he'll respond, "I'm glad we could come to an agreement." Note that if it is a Dwarven arrow or bolt he is attempting to buy from you, you can't actually sell it to him if you have more than one in your inventory. Drop or store all of the Dwarven arrows or bolts but one, and the appropriate dialogue will appear. If you go through the dialogue until you persuade him, then exit the conversation, you can level up your Speech skill which can be repeated endlessly. Even after everything I did for you and Faleen?† "Well, I'm not blind to the fact that you've been instrumental in improving my affairs of the heart. If you wish, you may enter my tower to view the museum section, but I'm afraid the laboratories are still off limits. That's the best I can offer." or, if you already have the museum key, "I've already provided you a key to the museum. You should consider it an honor. Few are allowed to browse my collection. I'm sorry, but that's as far as my generosity extends." But I'm a great admirer of your work. (Persuade) Passed: "What kind of a mentor would I be if I denied a potential student a glimpse at his master's ingenuity! Here, this key will provide access to my museum. Feel free to browse for as long as you wish. However, I must insist that my laboratory remains strictly off limits." Failed: "While I appreciate the sentiment, I still have to decline. Being an admirer, I'm sure you can appreciate the need to keep my research a secret." What will it cost to change your mind? (Bribe) Failed: "I'm not certain how many scholars you're accustomed to dealing with, but I can assure you that personal wealth is our lowest priority." Grant me access or you'll regret it. (Intimidate) Failed: "Do you realize that at a snap of my fingers I can bring the entire Markarth city guard to my defense? You best rethink this course of action or you may find yourself on the executioner's block." Forget it. Maybe I'll come back later. "Very well. Perhaps when my research is complete, I'll feel more comfortable discussing my findings with you." †Only available if you completed his portion of The Book of Love. When exiting conversation while the key is in your possession, he'll say, "I hope you enjoy touring the museum. Just don't touch anything." If you don't have the key, he'll say, "Oh, be certain to purchase my Falmer translation tome when it's completed! ", "Now, stand aside, there's work to be done. ", or "Try not to disturb me in the future, I'm in the midst of groundbreaking research!" If you talk to him later without the key, he'll say, "What is it this time?" or "This better be important." If you talk to him later with the key, he'll say, "I've already provided you with the key to my museum, what else could you possibly want?" While searching Nchuand-Zel, you may find notes (like this) from dead scholars. If you show these to Calcelmo, he'll say, "Oh really? Hmm... this looks like someone from Staubin's little group. A brave scholar, but not very wise.... If you find Staubin, it would be good to see any notes he may have collected. I doubt you'll find him alive, though." When you bring him Staubin's diary, he'll say, "Let's see. Ah, so that's what happened to Staubin. Tragic, but I warned him he was leading those people on a fool's errand. Unfortunately, sometimes the stone of scholarship is built on the foundation of death. I'll inform the kin. Here, I usually pay researchers for their work when they emerge from the ruins, but they won't be needing it anymore." The following items are sitting out in the store, for example on the store counters. They can be purchased from the merchant, or else can be stolen. Other items may also be present in the store, but those other items are not available for purchase. They respawn after ten days. Note: After completing his section of The Book of Love quest, these items are free to take. They will show in his inventory for sell once the Merchant perk is taken, but they are the same items and disappear from the store floor if purchased until the next respawn. This is the merchandise found in Calcelmo's merchant chest. These items are only available if purchased from the merchant; they cannot be pickpocketed or stolen. They are restocked every two days. NPCs in the game are not consistent in their pronunciation of his name. Some pronounce it "Cal-kel-mo", with a hard c, and others pronounce it "Cal-sel-mo", with a soft c. Some NPCs may even pronounce it both ways during their course of dialogue. Calcelmo may sell the ring you delivered to him for Kerah's favor quest. This issue has been addressed by version 1.3.3 of the Unofficial Skyrim Patch; he will equip the ring so that it is no longer visible for purchase in his merchant inventory. At some point after purchasing a Dwarven item, you will receive a note from Calcelmo in Markarth. If you go through the dialogue until you persuade him, then exit the conversation, you can repeat endlessly to level up your Speech skill.